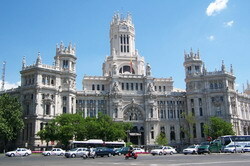 When visiting Madrid, you can book a per-hour car rental with driver from 2 hours/day and more. Meet and Greet service, offered by our company, will significantly simplify the meeting in the airport for the newcomers. Using a "car rental with driver" service you can vesit the places of interest, famous shops or outlets to do some shopping near the city, saving your time in this way. 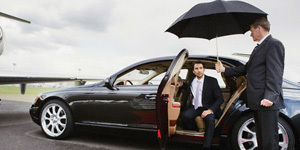 Madrid chauffeur service offered by our company will cost you much cheaper to order a car rental with driver with us than to hire a taxi driver. To book the economy car or minivan with chauffeur or a comfortable premium class car, coach, shuttle bus up to 50 seats, please choose the button. Per hour rental in the left upper corner of the page, write in the [Departure:] field the departure point and number of hours. Madrid is not only the capital of Spain, but one of the most beautiful cities in the world. It harmoniously combines the medieval culture and modern business centers, picturesque parks and the largest outlets, numerous museums and nightclubs of Europe. Going on vacation to Madrid, try not to waste your time, because there is so much to explore, there are so many places to visit here. Take a tour in the park Casa de Campo on a funicular, treat yourself to churros (donuts) in the local cafeteria, take a look at the Prado Museum, to inspire paintings of Botticelli, Rubens, Goya, visit with your children the Warner Brothers film company. To avoid time wasting, please contact our company. 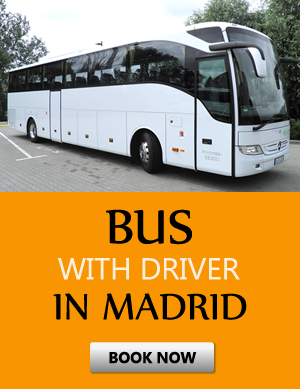 Here you can order a transfer to the hotel in Madrid and save a lot of minutes waiting for transport. Our services come in handy when it`s time to get from Madrid to the Airport - we will be happy to meet you and drive you to the destination point by a comfortable car. Please feel free to contact us!